Women lead society, men travel as they can. Guest reviewer Rachel Ward brings us an exciting book about a chilling future on Blogathon2012’s Guest Post Day. Silverhorse is the first book in the Katriona series, one of several written by Danish author Kaaberbøl, whose four-volume Shamer Chronicles fantasy series is published by Henry Holt Books in the USA. Check WorldCat to find a library near you to check out Silverhorse or check your favorite bookseller for a copy of this London-published novel. Its sequel, Midnight, has also been translated into English, but book 3 remains in Danish only. Perhaps reader demand will interest a US publisher in getting the entire Katriona series back in print. Silverhorse by Lene Kaaberbøl is set in a post-apocalyptic world where nobody is allowed to own the land, but it is passed down from mother to daughter. Women are the rulers with a duty to care for the land, and men lead an itinerant life. The main character is 12-year-old Kat, daughter of Tess, the maestra of Crowfoot Inn. Kat has a fiery temper and fights constantly with her stepfather. In the end, Tess has no choice but to send Kat away, despite it being very unusual for a girl to travel in this society. After a disastrous apprenticeship to a dyer, she ends up at the academy for Bredinari, who ride the strange and dangerous hellhorses – wild nightmares crossed with sturdy mountain horses – and serve justice and law in the land of Breda. Here, Kat has to learn to control her temper so she can master the weapons and horses she will need to handle. Events come to a head when she gets caught up in power politics beyond her control or understanding, and finds herself fighting for survival. The plot rattles along at a good pace and Kat is an engaging and sympathetic, if flawed, character. Her struggles with both authority figures and bullies her own age are all too recognisable and the book also tackles the reverse-sexism of her world, snobbery, loyalty, betrayal and true friendship. Kaaberbøl’s writing is truly fantastic, in every sense of the word. This is an excellent and compelling fantasy story, translated from the Danish by the author herself – being able to write as well in another language as she can in her own is a skill of which I am frankly in awe! *This review was originally posted on A Discount Ticket to Everywhere on Saturday 12th May, 2012. Since gaining her MA in Literary Translation in 2002, Rachel Ward has been working in Norwich, United Kingdom, as a freelance literary translator from German and French to English. She specialises in children’s and young adult literature as well as crime novels, fantasy and other contemporary fiction. She blogs on reading and translation at http://adiscounttickettoeverywhere.blogspot.com/and is on Twitter as @FwdTranslations. Her most recent translations, the Nea Fox books by Amelia Ellis, are available as e-books from Amazon and www.neafox.com. World Wednesday takes us to Cornwall in the 18th century, where the war between Britain and France is a backdrop to the drama of a young woman separated from her last friend. Ling must find her white circus horse before it’s too late. Thomas must find a profession after eye problems shut him out of school. Both must stay clear of the “crimpermen” who would send Thomas off to war and the constables who would send Ling to the hangman. Noted artist George Stubbs’ lifelike paintings of horses inspired the setting for this captivating novel in which Stubbs himself plays a major role. Author Mary Finn says that this young groom with noble horse reminds her of Thomas, while Ling’s jockey disguise looked like the outfit worn by Gimcrack’s rider in another famous Stubbs painting which recently sold for a record price. Enjoy this priceless story of friendship at your local library or independent bookstore. 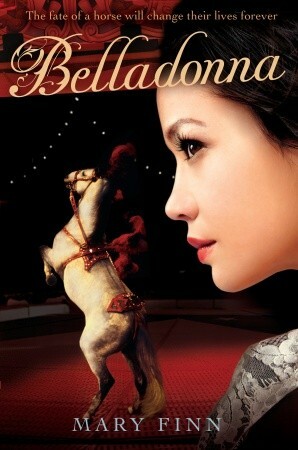 Recommendation: Beautiful circus horse Belladonna has been sold away, and her acrobat-rider is desperate to find her. Thomas has abandoned school after months of trying to make sense of letters and words, returning to work in his father’s wheelmaking shop, sketching maps and animals in his spare moments. Rambling the paths near his village, he discovers the young French rider seeking the horse butcher rumored to have bought Belladonna. Even though England and France are at war in 1757, Thomas decides to help Ling search for her beloved mare, entranced by her stories of their circus performances, leaping and dancing through the air. It turns out that Stubbs the horse butcher is really an artist studying horses’ bodies and beauty for his paintings. Belladonna did not stay with Stubbs, but has been passed on to a nobleman’s stables. The artist offers Thomas work as his assistant, detailing horse anatomy and improving his drawing skills. Ling’s impatience to find Belladonna grows as winter sets in and Stubbs cannot remove the mare from her new home. Will Ling try to rescue Belladonna by herself? Will English soldiers find the young French girl, even if she stays hidden in the countryside? Can Thomas settle down to a village wheelmaker’s life after learning about art and beauty and dreams from Stubbs and Ling? Charming Ling and tall Thomas are clever young people, trying to get past war-fueled suspicions and struggles in this lyrical novel that takes us to the time and place where the real artist George Stubbs drew and painted horses with precision and affection. (One of 5,000 books recommended on www.abookandahug.com) Review copy courtesy of the publisher. Garth is dying, and he knows it. His mom isn’t ready for him to go, but she’s a lot less ready for him to get pulled into the realm of ghosts while he’s still alive! Yep, a bumbling special agent gets sloppy in a supernatural capture-and-return so Garth is accidentally pulled into the afterlife. A rescue team heads after him, even if some beings in the Afterlife don’t want to let him go! My Book Talk:No ghosts among the living – that’s the rules. The living in the ghost world? Well, Garth is finding out how that works, as he gets dragged into the afterlife during a ghost capture gone wrong. Meeting his grandpa’s ghost, riding a night-mare, getting mixed up in Ghostopolis politics – soon Garth finds that he has special powers that unscrupulous ghosts want to use for their own bleak purposes. The young hero’s only hope of returning home is locating the Tuskegee Airman, that great-hearted man who built up Ghostopolis, who helps dead souls out of it and into their true homes Beyond. It won’t be easy, though. Life and afterlife, ghosts and the living, good guys and bad guys, and a chronologically illogical sense of time – hope the ghost-wranglers can get Garth out of Ghostopolis before it’s too late! This Eisner-nominated graphic novel is 288 pages of wow-factor art and snappy dialogue. (One of 5,000 books recommended on www.abookandahug.com) Review copy and cover image courtesy of the publisher.